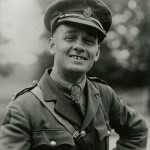 Captain (afterwards Lieutenant Colonel) Francis Alex Caron Scrimger, V.C., R.C.A.M.C., Medical Officer 14th Battalion, the first Canadian to win a Victoria Cross during World War 1. ORIGIN: The Royal Montreal Regiment traces its origins to August, 1914 as part of country’s response to the outbreak of war. The “1st Regiment, Royal Montreal Regiment” was raised by the amalgamation of several companies of each of three existing Montreal Militia Regiments: The 1st Regiment, Canadian Grenadier Guards (372 men and 12 officers); The 3rd Regiment, Victoria Rifles of Canada (355 men and 12 officers), and the 65th Regiment, Carabiniers Mont-Royal (276 men and 8 officers). As the Canadian Expeditionary Force (CEF) was organized by the Minister of Militia, the RMR was re-designated as the 14th Battalion (RMR), part of the 3rd Brigade, 1st Division. 983 men and 32 officers departed Montreal as the RMR, bound for Valcartier, QC for further training and reinforcement. WORLD WAR I: In October 1914 the RMR, over a thousand strong, arrived in Britain, together with the rest of the first contingent of the CEF. Six months after leaving Montreal, elements of the Regiment were already committed to the Western front, soon to be followed by the remainder of the RMR. 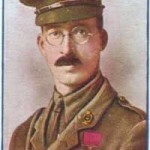 The Regiment’s first battle honour, YPRES, was coincidental with the first use of poison gas by the Germans. As can be clearly seen from the many battle honours proudly emblazoned upon the regimental colours, the RMR fought through much of the bitter trench warfare that characterized the Great War. In the process, the Regiment left a battalion, 1192 strong, in the fields of France and Flanders. 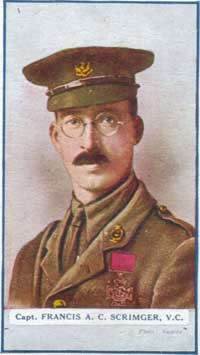 By war’s end, of the six thousand soldiers who had worn the RMR badge, three-quarters were casualties, and over half had suffered serious wounds. 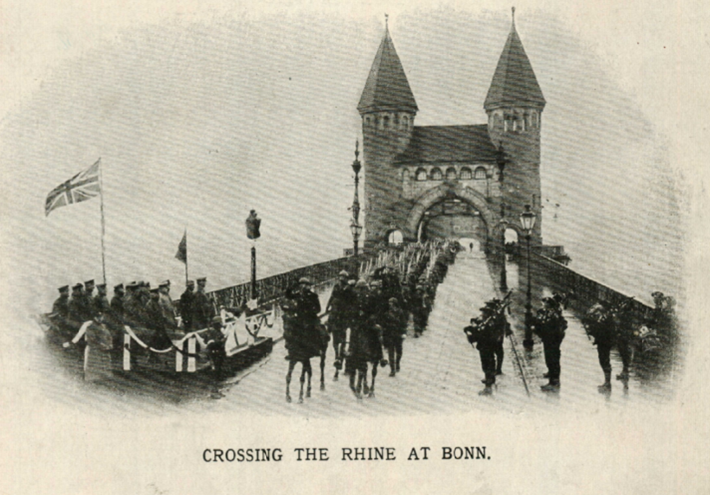 In November 1918, after the Armistice, the Regiment marched 82 kilometres to cross the Rhine at the head of the 1st Canadian Division. Typical of the RMR’s culture, all of the officers entitled to ride horses chose instead to march with their troops. As part of the Army of Occupation, at Unter Eschbach, Germany, on January 4th, 1919, the first King’s Colour and Regimental Colour were presented to the 14th Battalion (Royal Montreal Regiment) C.E.F.. The RMR was the first regiment of the British Empire to be awarded its Colours on conquered soil after a successful campaign (one of two Canadian units ever so honoured). 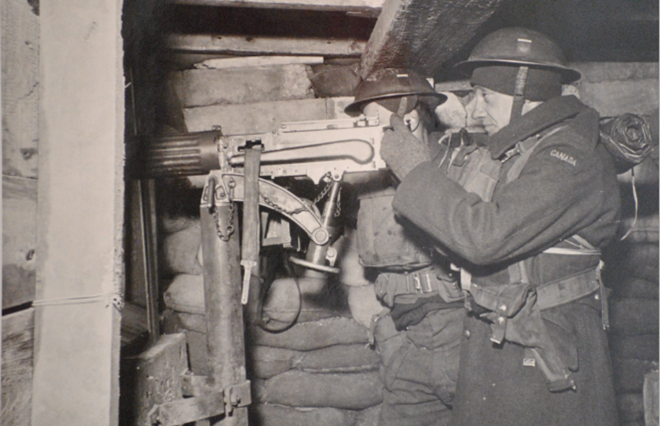 With the return of the Regiment to Canada, in early 1919, the RMR found itself without a home station, as it had not been part of the pre-war Militia system. Greatly to their honour, the 58th Regiment, Westmount Rifles, gave up their place in the order of battle so the RMR could continue to exist. Thus began a long and treasured relationship between the Regiment and the City of Westmount. With the aid of a plot of Westmount civic land, leased for 99 years at the generous rate of $1 per annum, and the fundraising efforts of the Westmount Armoury Memorial Association, the RMR moved into the St. Catherine Street Armoury in December 1925. WORLD WAR II: Following two decades of active Militia training between the wars, the RMR was again mobilized in 1939. With the sailing of the 1st Battalion to England in December of that year it was quickly apparent that a training depot was necessary, thus the 2nd Battalion was formed in the spring of 1940. While the 2nd Battalion continued in its task of providing trained reinforcements for overseas duty, the 1st passed through a long series of reorganizations. These saw the unit’s role shift from Machine Gun, to Armoured Reconnaissance and Armoured Cars, and finally to the designation of “First Canadian Army Headquarters Defence Battalion”. This unit embarked for the Great Britain on 7 December 1939. On 28 July 1944, the company landed in France as a unit of First Canadian Army Troops, and it continued to serve in North West Europe until the end of the war. The overseas battalion was disbanded on 30 September 1945. On 24 May 1944, a sub-unit of the regiment, designated No. 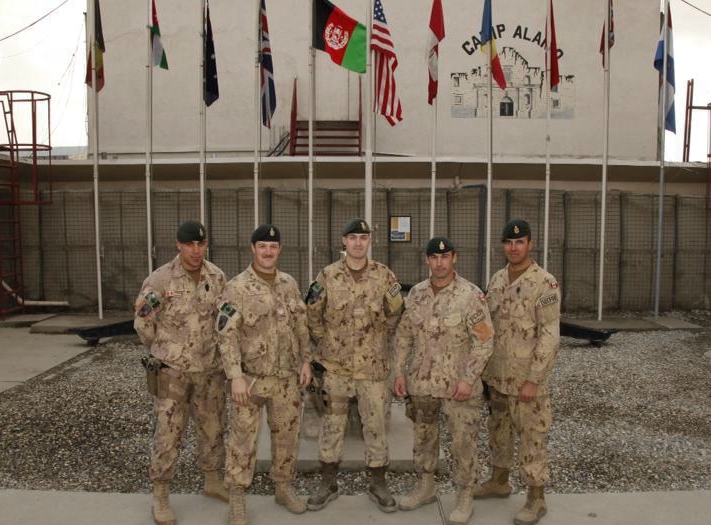 9 Defence and Employment Platoon (Royal Montreal Regiment), CIC, CASF, was mobilized in England. On 27 June 1944, it landed in France as a unit of First Canadian Army Troops, and it continued to serve in North West Europe until the end of the war. The overseas platoon was disbanded on 16 October 1945. On 1 June 1945, a second Active Force component of the regiment was mobilized for service in the Pacific theatre of operations under the designation 6th Canadian Infantry Division Reconnaissance Troop (The Royal Montreal Regiment), CAC, CASF. It was redesignated the 6th Canadian Infantry Division Reconnaissance Troop (The Royal Montreal Regiment), RCAC, CASF on 2 August 1945. The troop was disbanded on 1 November 1945. 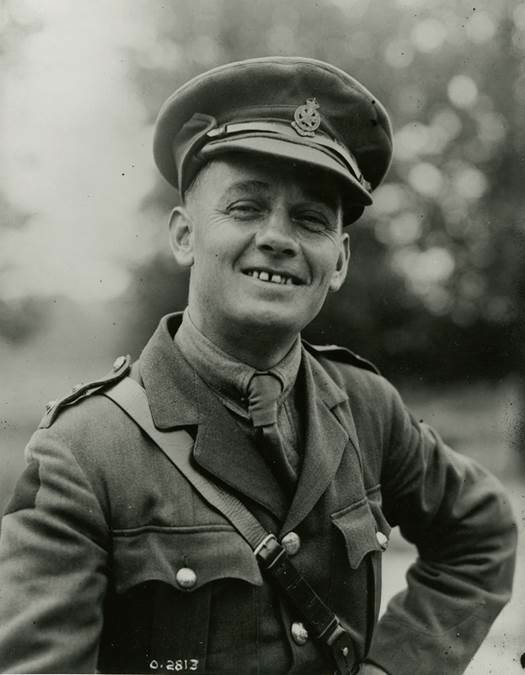 “This officer of the Royal Montreal Regiment Company attached to the Regina Rifle Regiment was in command of the assault company which was to form a bridgehead on the left flank of the battalion front across the Leopold Canal near Maldeghem, Belgium. – at 0630 hours the attack started. 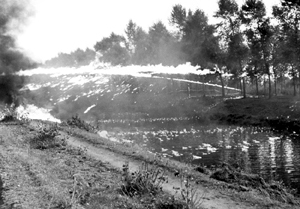 Accurate enemy machine-gun fire came from positions that enfiladed the canal and took a large toll of those in the boats. – By 1000 hours, ‘C’ Coy., Regina Rifle Regiment, had crossed into the bridgehead held by the Royal Montreal Regiment. They soon lost all their officers and most of the non-commissioned officers. Major Schwob took charge of the remnants of the company and continued to hold the bridgehead in face of fierce and continuous counter-attacks. MAJOR BARRE: In 1943, Major Paul Barre was second in command of the RMR, and went on course with the Army to participate with the Allied Military Government at the end of hostilities. After cessation of hostilities on May 5th, 1945, he was posted with the Allied Military Government in Continental Europe and then attached to British Army 5th Corps Headquarters at Carintia, Austria, and it was there his duties took him to the nearby village of Viktring to attend to a large group of Yugoslav refugees. There was, however, confusion over a decision taken at the February 1945 Allied meeting at Yalta, in the Crimea, regarding the return of USSR and Yugoslav citizens – both military and civilian – to their country of origin, whatever their wish. Major Barre disagreed with this interpretation, certainly with respect to the civilians, and made strong presentations to successively higher authorities in the chain of command. Eventually it was decreed that civilians would not be repatriated against their will, knowing full well the fate of probable execution that awaited them across the border. By the fourth of June, following a visit to Viktring by Field Marshal Alexander, the Supreme Allied commander in the Mediterranean theatre, when the situation was explain to him, a new Army policy was issued prohibiting the repatriation of military and civilian citizens against their will. This humanitarian intervention saved the lives of thousands of people. Recognition for this effort was manifested at a reception held in the Officer’s Mess on April 4th, 1987, when Major Barre was presented with “the degree, rank, and status of a Knight Commander of the Order of the Saint-Sava for his outstanding service to the Yugoslav Royal Army in 1945”. POST-WORLD WAR II: The post war history of the RMR, while perhaps appearing anticlimactic, is nonetheless replete with the efforts of peacetime soldiering, interspersed with the many weekend exercises and annual concentrations that have made up the more than half century since the war. RMR soldiers have seen service with the United Nations Forces during the Korean conflict, as well as on numerous peacekeeping missions throughout the world such as Cyprus, Egypt, Golan Heights, Congo, Afghanistan, Bosnia, Croatia, Sudan, and many more. Domestically, there were RMR soldiers on duty during the Cuban Missile Crisis, the October Crisis, the Oka Crisis, the 1998 Ice Storm, the Millenium Bug, the Vancouver Winter Olympics, and the Monteregie floods..
OFFICIAL BILINGUAL STATUS: It is appropriate to note that the RMR is an officially bilingual unit. The designation “bilingual” came about due to two meaningful events. At the outset of hostilities in 1914, the Regiment was formed through the drafting of infantry companies from both English and French Militia regiments. Therefore, ever since its inception, The Royal Montreal Regiment reflected the bilingual nature of its province of origin and of the city it proudly bears in its name. The second occasion occurred in 1968, when all units of Quebec Command were informed that written orders and communication would be issued in either English or French. Each unit in the Command was instructed to indicate its language of choice, and thereafter become so designated. The RMR informed Quebec Command that it was neither English nor French, but in fact both, and would be pleased to be known as a bilingual regiment. In recognition of this unique situation, Quebec Command officially designated The Royal Montreal Regiment as bilingual in its routine orders of October 1968. As a result, the RMR became the only military unit in Canada to be officially recognised as bilingual. Other units have since followed suit.